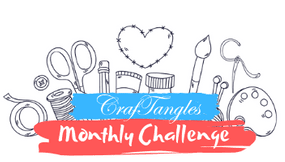 This is Angela Jose, crafter and blogger at The Crafty Angels , bringing over some Christmas yumminess using the recent Christmas releases from Craftangles. 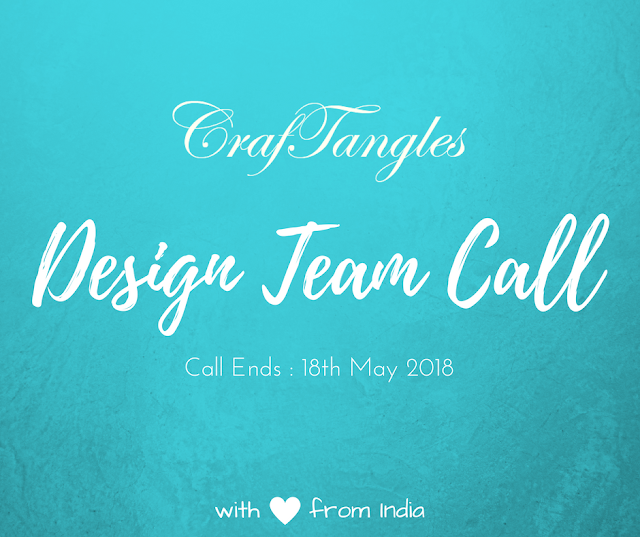 Before I start with the post, a huge thanks to Khyati for giving me this opportunity and I am truly happy with the amazing variety of options they had this Christmas – such a relief that Indian craft supplies are filling in the huge supply side gap with quality products. Starting off, I made three different cards with Christmas release stamps & stencilsfrom Craftangles and my most favourite ones is this Christmas bauble card. The background card panel is stamped with altenew crip dye ink in shade soft lilac with “flourishes” hero arts background stamp and is mounted on white card base with glitter washi tape border. The baubles stamps are from Craftangles set – Christmas Ornaments and I got the 3D effect by layered stamping with different shades. I applied altenew crisp dye in shade lavender fields around the perimeter of the bauble only and stamped it first. I stamped over it the second time after applying altenew ink soft lilac all over the stamp area. For a defined border, but not too bold, I stamped the bauble border stamp with hero arts soft granite ink. 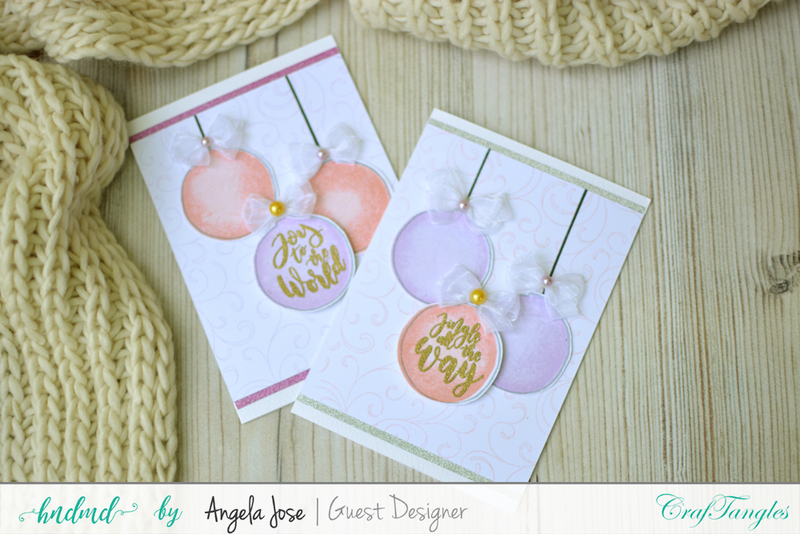 The Craftangles Christmas Ornaments stampset comes with a variety of sentiments that can be accommodated in the bauble and I chose two different ones in both my cards and they were heat embossed with super fine gold embossing powder from ranger. The baubles were fussy cut and adhered with double sided foam tapes. The tiny cute bows are handmade from 1cm wide organza ribbons and half pearl embellishments. 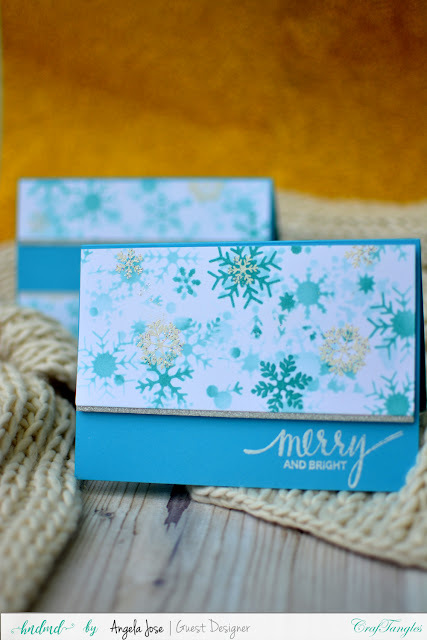 Next card is a very pretty snowflakes card that has lot of depth and details. I have used the snowflakes stencils from Craftangles to create this background with peacock feather distress ink. 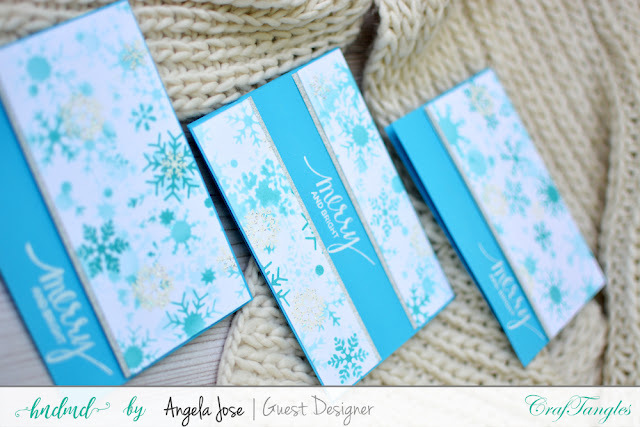 The idea is to create a depth in the snowflakes scene by brushing lighter and darker shades of distress inks with the stencil in varied positions. I started with small amount of ink to create lighter patterns first, changed the stencil position and then created darker/bolder patterns. I also used the tiny snowflakes stamps fromCraftangles Merry Christmas to heat emboss with ranger snowflakes tinsel embossing powder for an added interest here and there. This background was then cut out into three panels to make three different cards on blue colored cardbase. 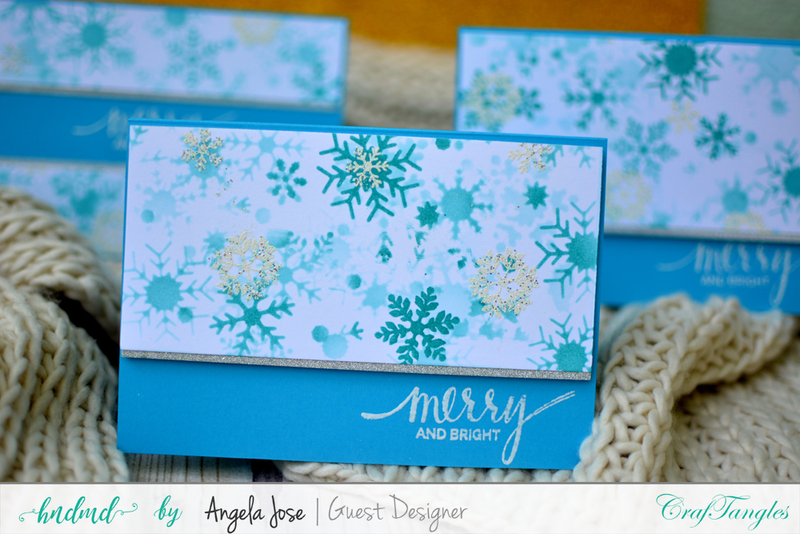 The sentiments are from MFT handlettered holiday stamp set and heat set using white embossing powder from ranger. The last set of cards is a really fun and jolly card with a lot of interest lines. 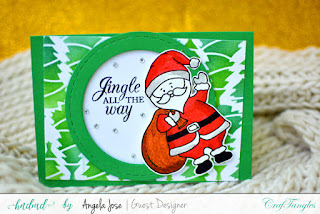 The Santa clause is from the CraftanglesMerry Christmas stamp, which was colored using zig brush pens and fussy cut. The background is made by lightly brushing distress ink in shades candied apple + festive berries for the plaid background and in shades mowed lawn + pine needles for the Christmas treebackground on craftangles stencils plaid and Christmas elements respectively. 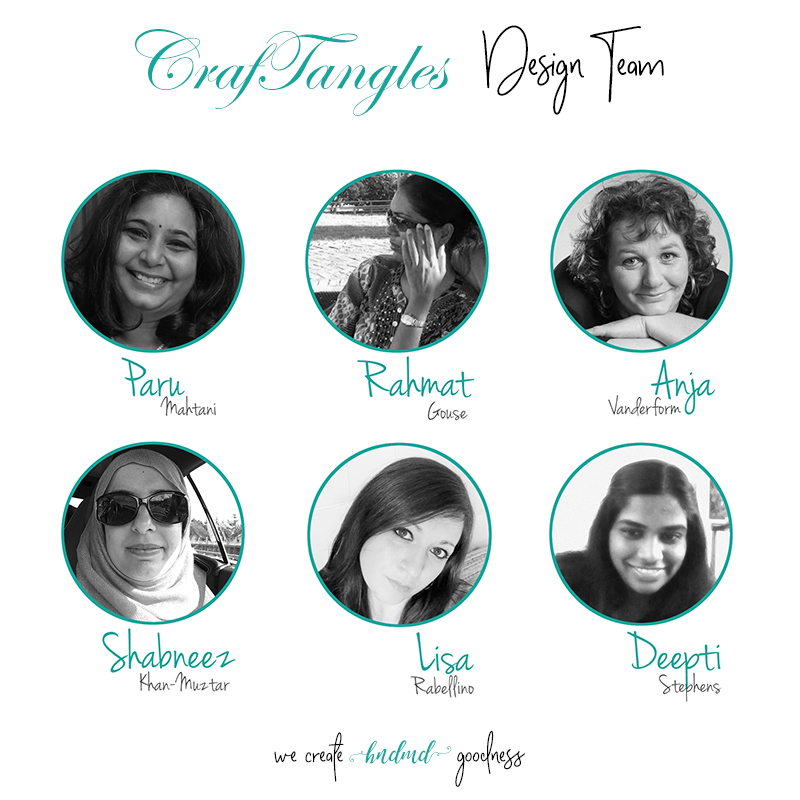 A circular white cardstock cutout was placed at the center which was covered with a stitched circle frame mounted with double sided foam tape. 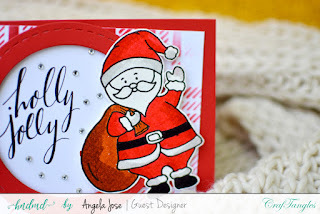 The sentiment is from MFT handlettered holiday and Hero arts Christmas Holiday sentiment which is perfect for the cheerful Santa which was placed along the circular frame. 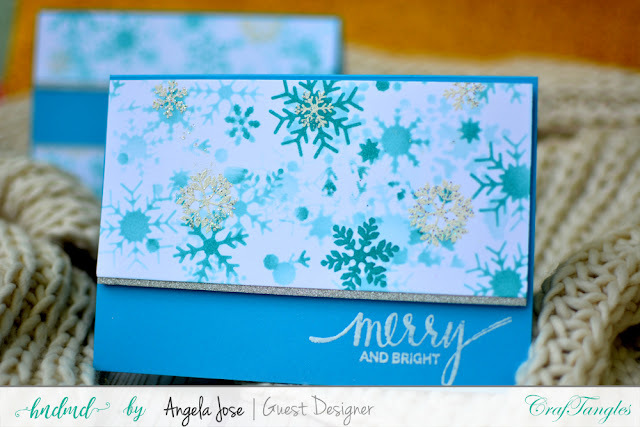 A little sequins and rhinestones to break the monotony of the colourful background and draw attention towards the card center was added around the sentiment.